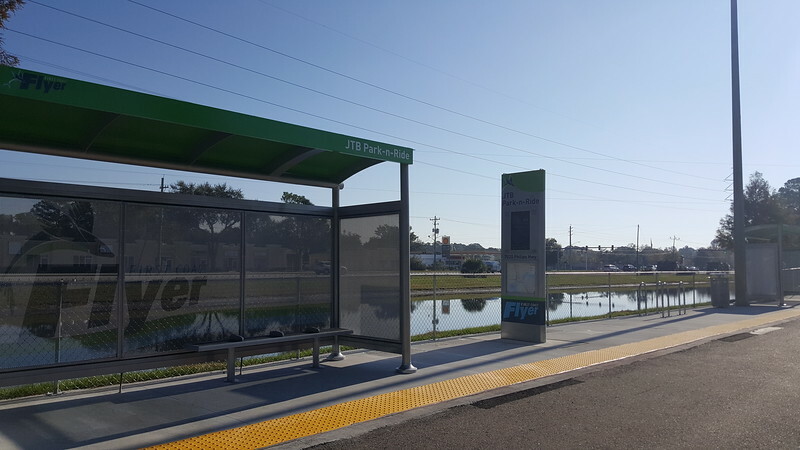 The Jacksonville Transportation Authority (JTA) is gearing up to launch the First Coast Flyer (Bus Rapid Transit) “Blue Line” on Monday, December 5, 2016. The Blue Line will operate between Rosa Parks Transit Station and the Avenues along Philips Highway with stops at major destinations to include MOSH, Baptist Health, the Park-n-Ride lot at JTB/Philips and the Avenues Mall. The Flyer will connect customers to jobs, education, entertainment, restaurants, healthcare and more with features as unique at the region it serves. The 11.1 mile Blue Line on the Southeast Corridor will feature direct, high-frequency service; seven branded stations; transit signal priority at 18 intersections (holds green lights, allowing buses to move through intersections without stopping); off-board fare collection; complimentary Wi-Fi; a Park-n-Ride lot and real time bus arrival information. The Flyer makes fewer stops and offers 10-minute frequency during weekday peak hours and 15-minute frequency in weekday off peak hours. The $23.8 million project is funded by the Federal Transit Administration, Florida Department of Transportation and the JTA. The Blue Line replaces Route 7 (Philips). In addition, December service changes include the launch of Route 27 (Philips/Avenues) providing local service to Phillips Highway/Avenues Mall via Bonneval Road and Baymeadows Way and Route 35 (Sunbeam/Baymeadows) providing service to Prominence Parkway and Freedom Crossing Trail to Crown Point Road and San Jose Blvd. Community outreach specialists are available to assist customers with the changes. The First Coast Flyer serves as the backbone to the regional transit system. 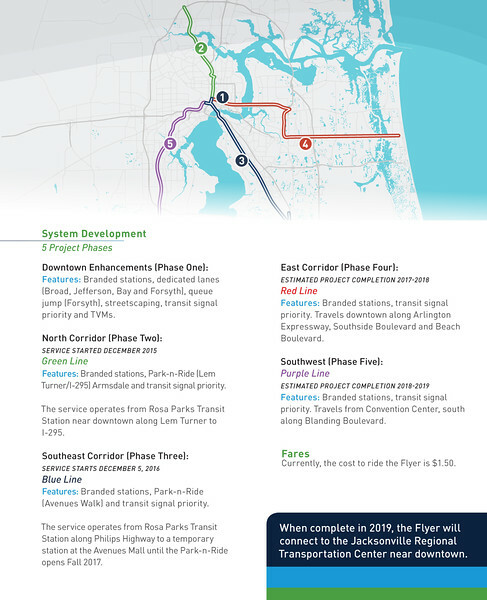 When completed in 2019, the Flyer system will cover 57 miles of destination travel, and will be the largest bus rapid transit system of its kind in the Southeast. The branded Compressed Natural Gas (CNG) buses serving this corridor have a sleek, aerodynamic design that incorporates a raised, raked-back front cap blended into a full length, contoured roofline. Its modern profile makes a distinguished statement. The flying fish embodies the “Flyer” part of the name. Like the flying fish, the vehicles in the First Coast Flyer system will move smoothly along, gliding to their destinations. 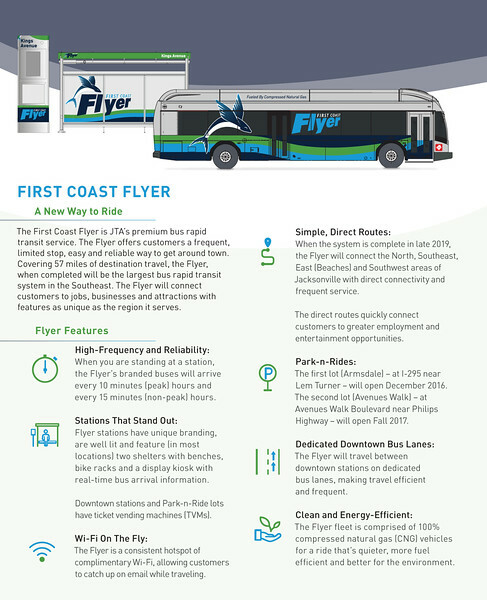 For information about the First Coast FlyerTM, please contact the JTA’s customer service line at 904.630.3100; TDD 904.630.3191 or visit www.fcf.jtafla.com.